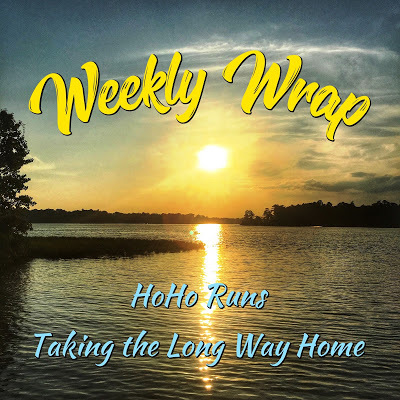 Week 7 of marathon training went exceptionally well — every goal pace was hit and the 52-mile week was about to close — and then in the blink of a long run, I couldn't run anymore. What in the blazes happened? On Saturday, I headed out for a long run at my parents' place feeling tired but fine, if anything, my hamstrings being a little tight would be my only complaint. Not even a complaint really, that's just regular running probs. Goal was 16 miles at 8:05/mile average and I started out feeling sluggish yet stuck around the 7:45-8:00 pace range for the first 11 miles. Somewhere before that my left knee felt a little irritated, I figured from the slant of the road or running on loose gravel for certain stretches. My solution is to switch sides of the road every once in a while to "even things out" (in theory). In the loose gravel portion, that left knee soreness turned into a tight right groin. Huh. I stopped to stretch, literally laying in the gravel road because I didn't have to worry about traffic. That didn't seem to do much, so I got up and kept trucking, likely because the runner's high had prevented me from feeling "all the feels". At mile 12, those "feels" went from annoying me to instead demanding my attention. Thankfully I was almost back to the farm and I hobbled back the quarter mile in a weird limpy-run fashion. My crazy side thought, "Can't I make it just 4 more miles to finish this? ", and logic (and my groin) responded, "Uh, no. Go home." As my body gradually cooled down from the run, my right-side groin tightened up worse. When I got back, my husband was surprised at how dirty I was (from rolling/stretching in the gravel. ha.) but I don't think even I realized how nasty that groin prob was. I tried stretching but it didn't feel like it helped. As we headed out to the state park with my family later that morning, I wasn't able to carry the baby in his carseat. I just hobbled and pretty much wanted to avoid walking even a step for the rest of the day. 6 days later, here I am, doing much better but not comfortably running. Though a groin pull or strain is just small beans in the big scheme of life's trials, this has been a humbling injury. Not being able to get as much done at home or cover the miles - or even one mile, for that matter - has been extremely frustrating. From being able to run 50-mile weeks to not even running a circle around the neighborhood, while the rest of me feels great but my groin says, "Yeahhh, running? No thanks!". This experience has completely knocked me on my tail. So that's where I'm at. According to the Hansons Marathon Method book, "once you're in the final 4-6 weeks of training, the pros and cons of racing should be weighed." I have until September 15th to defer my entry to 2019 and, as of right now, racing doesn't seem worth it. The goal was to not just cover the miles but to set a new PR, finally break under the 3:20 barrier, but that's completely out of reach now. Now what? Even in the hiccups of life, I know God is bringing good out of this and reminding me that A) I am not invincible and B) It's okay to slow down sometimes. I'm doing my best to see this surprise turn of events as a learning experience because life IS really good. A pulled groin is a lemon and I WILL use it to make lemonade. That's a wrap for now. Excuse me while I return my bag-o'-frozen-peas ice pack to the freezer. Injuries. What was your last one? What would you do in this situation? W7D1 Easy Run 7.04 mi, 01:02 @ 08:46 pace mostly on the gravel, some road, on this foggy, cool morning. Felt great. And hopefully a little moisture will help clear the smoke. W7D2 Strength Intervals, 3 x 2 miles, 800m recovery (goal 14:20-14:40), 8.01 mi, 01:00. Went well this morning and I’m feeling less of the allergy symptoms now that it rained. More rain please! Intervals @ 14:31, 14:18, 14:27. W7D4 Tempo Run 9.01 mi, 01:06 @ 07:20 pace this morning. Felt great, enjoying the 50°’s in the early AM. W7D5 (Treadmill) Easy Run 6 mi, 00:55 @ 09:05 pace feeling “meh” with a headache. W7D6 Easy Run 6.01 mi, 00:54 @ 09:01 pace outside, 60°-something and 98% humidity!!! I think it may have rained a teeny tiny bit last night (finally)! W7D7 Long Run of 16 miles but cut short due to injury, sadly... 12.22 mi 01:37 07:55 pace. W8D1 Injured - Able to walk better than yesterday but sore on my right upper-groin. Unable to lift my left knee without a sharp pain in what feels like a tendon or ligament. W8D2 Injured - 00:25 Runner’s Yoga by Elkhart Yoga (YouTube video). Chiropractor in the morning to be adjusted and she advised stretching, ice and to see how it goes in the next week and some. Each day I'm feeling improvements on my right groin/pelvis area. W8D5 Injured - Quick walk with our pup in the evening followed by 20 minutes on our new stationary bike (little fold-up one from Amazon). It’s comfortable and will come in handy for cross training! No pain, plus the seat is comfy 🤗 Quads were on fire and I was sweating. Not sure how many miles I covered. W8D6 Injured - I woke up this morning feeling MUCH better. The groin injury seems to be healing and now feels more stiff than painful. I can tell the tight groin or illiopsoas whatever you call it has been pulling on my pelvis, as the middle of that has been sore now. I push mowed our back lawn and that felt fine. Biking (6.5 miles today), walking, bringing up my knees, etc all feels fine. I did jog a few strides and that went well but something still feels tight. W8D7 Injured - 2.02 mi 00:32 16:00 pace in 5 minute run/walk intervals. More so, jogging, at a 12 or 13-min/mile pace. The pain is gone for the most part (pops up randomly when I pick up children in weird positions, etc) but the muscle itself feels stiff and I feel timid running on it. I planned to run for longer but the walking got boring and jogging wasn't fun. Headed to the stationary bike after. W8D7 Indoor Bike 8.38 mi, 00:30 @ 16.8mph pace. Rode for 30 minutes to "substitute" for the run that was scheduled to happen. I really enjoy the bike but WOW do my quads burn! It's been good for me, that's for sure. I don't know if the bike's mileage is correct (it was a cheap one) and I know very little about the biking world. All I do know is it's very comfortable to do, makes me sweat like a dog and gets my heart pumping! Disclaimer: I received Knockaround Premium Sunglasses in exchange for my review as part of being a BibRave Pro. Learn more about becoming a BibRave Pro (ambassador) and check out BibRave.com to review find and write race reviews! With all the bold, wild patterns rocking the fashion world these days, isn't it right to have shades to match? As a BibRave Pro, I received two colorful pairs of Knockaround Premium Sunglasses to wear wherever the summer life takes me. Knockaround Premium sunglasses are made of lightweight polycarbonate material and come in a ton of colors that are sure to match your race-day gear and everyday casual outfits too. I received a pair of Glossy Tortoise Shell/Green Moonshine shades and a pair of Clear/Moonshine shades. I love the style of these glasses! 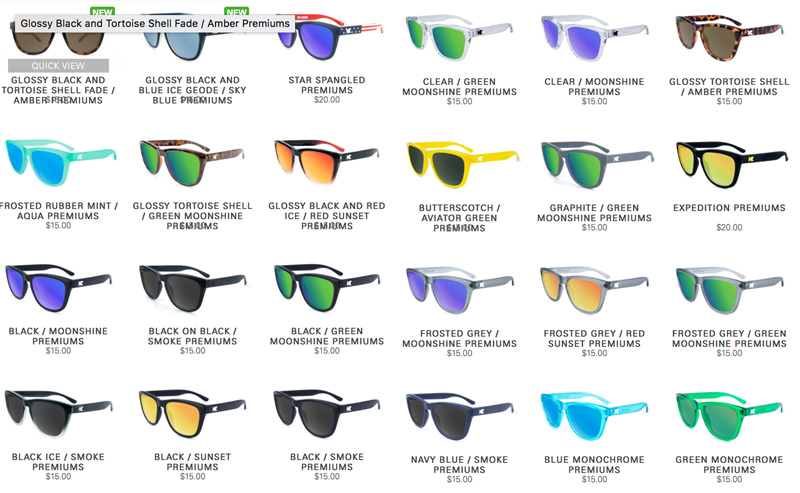 The Knockaround Premiums Styles: Check out the whole collection here! The Premium lenses are polarized to knock out glare and are impact resistant with full UV400 sun protection. Even with the fun colors, the Knockaround sunglasses seriously protect your eyes too! I found the Knockaround Premium sunglasses to be comfortable for every day wear and for short runs. Personally, I wouldn't wear them for long runs because my sunglasses do slip around a bit and that is a pet peeve of mine. One thing is for sure: These sunglasses are durable enough take a beating because my boys wear them too. Maybe they should each have their own pairs! 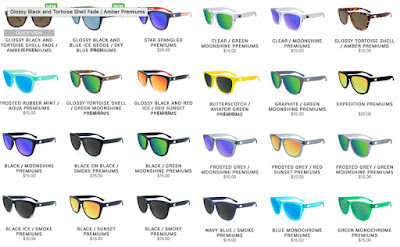 The Knockaround Premium sunglasses are very affordably priced at $15 for non-polarized and $20 for polarized (plus, check below for a discount code!). What color shades are just your style? Disclaimer: I received OOFOS OOMG Fibre Low shoes in exchange for my review as part of being a BibRave Pro. Learn more about becoming a BibRave Pro (ambassador) and check out BibRave.com to review find and write race reviews! For the first time in a LONG time, I ran a 50 mile week (last week) and it actually wasn't that bad. It's certainly a lot of miles (for me) and Hansons' goal of cumulative fatigue was achieved but my body seemed to handle it well. I'm tired but I don't feel any pre-injury "niggles" surfacing. Part of my fatigue is likely marathon training. Partly a not-sleeping teething baby lately. Partly summer life! There is so much fun to take in and things to do in a small window of time. Our pool is now closed for the year and I feel both sad and thankful — sad because summer is coming to an end, thankful that I don't have to lug three kids to the pool solo (oldest loves it, middle fights me every time, littlest is a wild baby). Balancing the higher mileage training and daily life has reinforced the importance of active recovery. Back when I ran 50-mile weeks more regularly, I had a desk job that allowed me to sit (which is somewhat of a double-edged sword) and only one small person to care for after hours, allowing for more rest time. Running "Easy-Effort Runs" at an EASY pace. For real! Choosing footwear that treats my feet and legs well. Taking a sit down break in the afternoon when baby naps. Hansons Marathon Method is teaching me to be more strict with my pacing and my recovery footwear choices have been broadened now too. As a BibRave Pro, I received the newly released OOFOS OOMG Fibre Low shoes to take some of the load off my body. How does OOFOS help you to recover faster and feel better? OOFOS OOMG Fibre Low shoes are comprised of OOtex Fibreflex fabric and OOfoam recovery technology that absorbs 37% more impact than other footwear and is scientifically proven to reduce stress on your body while walking. The footbed design cradles my arches and moves naturally with each stride making them extra comfortable for all-day wear. To wash my OOFOS, I simply rinsed them in the sink with water and mild soap or throw them in the washing machine on a cold cycle with mild detergent. Easy peasy! The OOFOS Fibre Low shoes are now available on OOFOS.com for $139.95. 3% of all OOFOS sales goes to breast cancer research through Project Pink => that's footwear for a good cause! What are some of your active recovery secrets? W6D1 (Treadmill) Easy Run 5 mi, 00:46 @ 09:11 pace and reason #98 it’s always better to wake up early to run. Hubs has been working all weekend and each child had a secret plan to keep mom from running tonight. Somehow the miles did get done! W6D2 Strength Intervals, 4 x 1.5 miles w/ 800m recovery (goal 10:45-11:00/interval), 8.16 mi 01:01 07:31 pace. Ran 10:39, 10:43, 10:41, 10:38 and felt relatively good considering the 84% humidity! It wasn't that warm this morning (75 degrees?) but the humidity had me sweating buckets. W6D3 Off. Appointment, groceries, school supply stop and library. And the weather was so cool today the pool didn't even open! W6D4 Tempo Run 7.09 mi, 00:52 @ 07:21 pace in 85 degrees and sunny at 6pm when my husband got home from work. Great weather for the pool but NOT for running! All because I didn't get out of the house early that morning when it was a beautiful 46 degrees :( Baby has been having a hard time with a new tooth that broke through and I knew he needed extra cuddles. All started out fine but the heat started to turn my stomach and affect my heart rate at about mile 4. I cut it short because it seemed to be doing more harm than good. Miles were 7:19, 7:20, 7:16, 7:17, 7:12, 7:35, 7:33. Adding mileage on to tomorrow run to make up for it. W6D5 Easy Run + 2 Tempo Miles 7.06 mi, 01:00 @ 08:33 pace early in the morning when the weather was a lovely 50-something. I stuck to the easy pace except for the two tempo miles (leftover from yesterday) at 7:42 and 7:38. Not quite tempo pace but that's all my body had left. Feeling tight in my ribs/abs from yesterdays run. Must have been breathing different, more shallow in the hot weather? W6D7 Long Run 10.02 mi, 01:17 @ 07:41 pace (8:05/mi goal) outside, though I don’t think the smoke or harvest dust did me any favors. Sore throat and draining sinuses are so annoying - thankfully I’m not pregnant this harvest so I can take something for the headache! Miles @ 7:53, :40, :39, :39, :45, :46, :43, :39, :38, :38. Disclaimer: I am promoting the Torchlight 5k as part of being a BibRave Pro. Learn more about becoming a BibRave Pro (ambassador) and check out BibRave.com to review find and write race reviews! My race calendar usually includes a full or half marathon (or two) for the year and then I run shorter distances spontaneously as the race opportunities pop up. If you're always up for a summer race like me, the Torchlight 5k is one you won't want to miss! 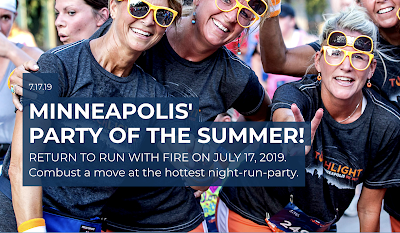 The Torchlight 5k in Minneapolis is the hottest night-run-party race in Minnesota where runners experience the magic of a summer night in the Twin Cities! Some years this race can be a hot one (their hashtag is #RunWithFire, after all!) but 2018's weather proved to be absolutely perfect for a run. 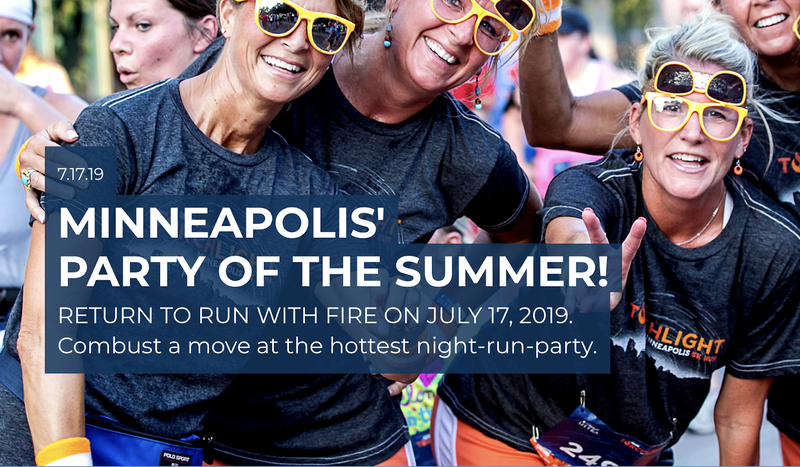 Live music, sunset scenery, the energy of the runner community, and complimentary beverages (alcoholic and non-alcoholic available) plus food and snacks sound like a perfect way to spend a summer evening. If that's not enough, here are even MORE reasons to run the Torchlight 5k next July! 1. It's a NIGHT Race! Run off into the sunset at the Torchlight 5k with the starting time at 7:30 pm and the Torchlight Finish Festival rolling 'til 10 pm. 2. Take Off with Live Music. This year's starting line featured live music and even more live music at the legendary Torchlight 5k Finish Festival! 3. FREE Race Photos courtesy of Athlinks. Aren't free race photos THE BEST?! Thanks to Athlinks, participants receive free race photos and live race results. 4. Unique Minneapolis Race Route. This year's spectator-packed route ran along the Aquatennial parade route and included two aid stations. 5. Voted One of the BEST 5k Races in the U.S. Enough said. The Torchlight 5k has received a stamp of approval from the BibRave 100, so you know it's a good one! Mark your race calendar now! The Torchlight 5k's race date is set for 7/17/2019 and early bird registration is open NOW! The registration fee is very reasonable at $25 for Adults. Check out my fellow BibRave Pro Casey's review to get all the details on this year's race!